The Mustang restoration continues to make progress. Although, I've been fortunate to have a fairly rust free passenger side, there have turned out to be some areas of the rear quarter panel, parts of the door and the front fender that wouldn't look too "classic" if left alone. That's why you see the epoxy primer on the passenger side of the car. You'll notice from the picture above, several odd looking marks through the primer on the quarter panel. This is where I found and filled several small low spots, which could have shown up in the final paint as waves. To make a good smooth restoration of the surface on that panel, it can be difficult to block sand the filler to blend in with bare metal. This is because the hardness of the metal,compared to the softness of the putty,can cause uneven transitions. Covering them both with a fairly hard surface with enough thickness to sand evenly does the trick. And epoxy surfacer is a great rust preventative. As topics of the restoration are covered, you'll see links to the various tools and materials used. Here's a few we just used. Click on the links for more detailed information including material and parts descriptions and what various types of tools are used for. 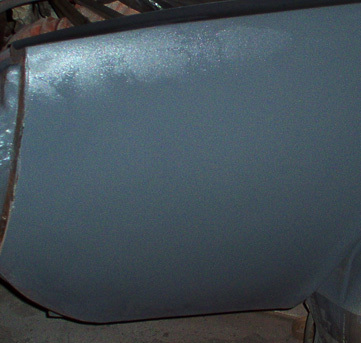 In Part 3 we'll look at rear quarter panel repairs on the 1965 Mustang restoration in more detail . Whether it's finished or just started - we'd like to see and hear about it.